We've had a pretty cool August here in Virginia. Lots of rain: stormy days and cool, soft-aired evenings. When making dinner the other night Mr. B came up with the idea that we might have a nip of whiskey to cap off dinner (a grilled summery meal). But HOW?! We're not really shot-drinkers... ever. Because we are admittedly light-weights. I can barely drink a cider and remain un-drunky. Two ciders and I become smiley-doofy-trips-on-the-stairs-repeatedly Renee. YES you heard me. Keep me away from the stairs at your cider party. So what did we do? Snapped together a fiery, tangy, sweet medley of spice-addled deliciousness to melt our brains into fuzzy dream-sequence foggery. I doubly love this drink because it really is a tonic. Ginger is great for waking up the stomach before eating, soothing tummy aches, and relieving nausea. Lime is alkalizing, making it a great food for those of us with overly acidic systems. Lime is also anti-bacterial, revs-up immune function, and contains antioxidants which help to fight the free radicals that cause cancer. WOOHOO! Essentially, we adapted this idea from The Inspired Vegan. But we've made it our own: simpler, and more kick-you-in-the-face delicious. There are two ways to do this. One way (the easy way) is to use a high-powered juicer. 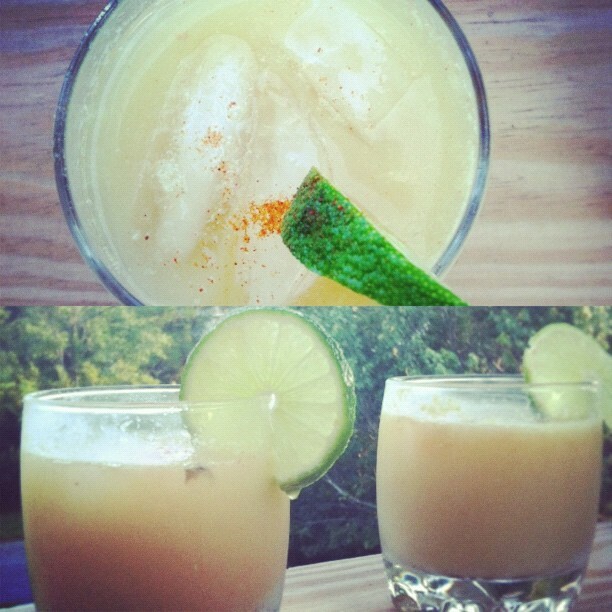 The other way (ok... it's the hard way) requires hand juicing the ginger and lime. Yeah it's a bit more time consuming, but that extra sweat makes it taste even more delicious riiiiiiight?! Well... hopefully the friends you share this with will at least appreciate your honest vigor. Also, as a side note, you may need more ginger and lime if you hand juice, as less liquid will be expelled from the pulp. Set aside 4 small drinking glasses. Get out your juicer. Turn it on, toss in the ginger and 1 & 1/2 de-seeded limes, and decant the expelled juice into a tall drinking glass. Mix in the agave and whiskey. Stir. Add a portion of the sweetened whiskey and juice to each small drinking glass. Add 2 cubes of ice to each glass. Fill each glass to the top with sparkling water, and gently stir the drink around. Top each glass with a pinch of cayenne and garnish with a lime slice. Peel and dice about 6 inches of ginger, getting the pieces as small as possible. Roll your limes on a hard surface to break up the sugars inside, and then halve them. Get out a medium sized bowl or a large mortar. Spread a cheesecloth or the like out inside of the bowl. Place your ginger in the bowl, on top of the thin cloth. Close up the cloth, twisting at the top. Mash the ginger as best you can, squeezing out the juice by twisting the cloth as you go. Consider using a pestle or a similarly rounded masher. Set the juice aside. You should get at least 2 tablespoons of ginger juice. Juice your limes by squeezing out the juice by hand into the same bowl as the ginger juice. Add agave and whiskey. Stir to incorporate. Add a portion of the sweetened juice & whiskey mixture to each short drinking glass. Add 2 cubes of ice to each glass. Fill each glass with sparkling water. Gently stir each drink once or twice. Add a pinch of cayenne to each glass. Enjoy watching your friends get kicked in the face by this tasty-hot summer sipper!